Optelec Compact 5 HD - Portable Video Magnifier 3 Hrs. of Battery Use! Optelec Compact 5 HD - Experience a revolutionary breakthrough in electronic hand-held low vision technology with the Optelec Compact 5 HD portable video magnifier. 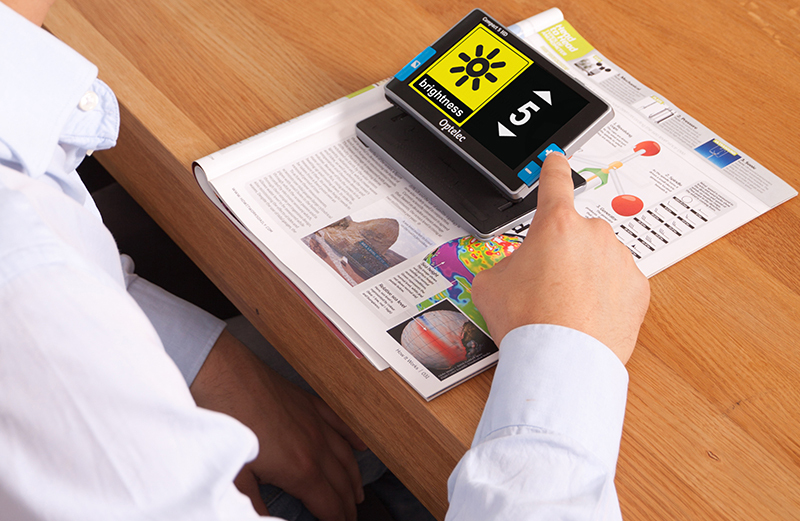 Lightweight, always in focus and easy to use, the Compact 5 HD offers two different ergonomic reading positions. In High Definition, you can now read from glossy magazines, letters, displays or price tags in both the lowest and widest continuous magnification range available. To meet your specific needs, each low vision setting can be customized and saved through a special large icon menu. A true replacement of the traditional optical magnifier. * Portable and lightweight at only 10.4 oz.